Oh, no. Given an astronomical 85 percent chance by the oddsmakers of winning at least 73 games prior to their outing yesterday against the Boston Celtics, the Golden State Warriors lost. Now, the age-old saying, “Every game counts,” is more than consequential. It’s imperative. GSW now stands at 68-8. The math is simple: Win the next five or six and they best the all-time record set by Michael Jordan and the Chicago Bulls in 1996. If they lose two out of six, they equal the record. Worse than that and it’s huge, huge disappointment for the defending champions. Yesterday, when Steph Curry unleashed that 28-footer with 5.3 seconds left in the ballgame, we all believed it would land inside the hole. Wasn’t this the MVP who made six consecutive threes in the 3rd quarter? Golden State trailed most of the game. Although they converted on 20 three-point shots (imagine, that’s a total of 60 points), they committed too many errors (Curry alone made nine of the team’s 22 turnovers). Boston played well; they drove the lane often for uncontested lay-ups and played tough all throughout. They weren’t rattled, even if the Warriors had never lost at home the last 54 games (and 14 months). The heartbreaking sequence involved Draymond Green: While he stole the ball from Amir Johnson with 30 seconds to go, in the next play (seven seconds later), it was his bad play that resulted in a steal by the same Amir Johnson. You know the saying of marathon runners? The toughest part of the 42K is the last kilometer. It’s the same for this Californian squad. As the media questions intensify and as the world’s eyes zoom towards their history-shattering feat, the pressure rises. The opponents possess an I-have-nothing-to-lose mentality while the Warriors have everything to lose. Six games remain and every one of those six meetings is crucial for GSW. What’s their schedule like? They play their next three at home (in Philippine time: against Portland on Monday, versus Minnesota on Wednesday, and against San Antonio on Friday) before a two-game road trip that takes them to Memphis (next Sunday) and San Antonio (next Monday) as they cap off the regular season with a final Oracle Arena game against Memphis. The game against Portland tomorrow is all-important. Remember that the Blazers was one of a handful of teams to have defeated the Warriors. This was last Feb. 19 when GSW lost by 32 points. And, in that game, while Steph made 31, his nemesis Damian Lillard scored 51. The consolation for the Warriors: they lost that game not at home but at the Moda Center. 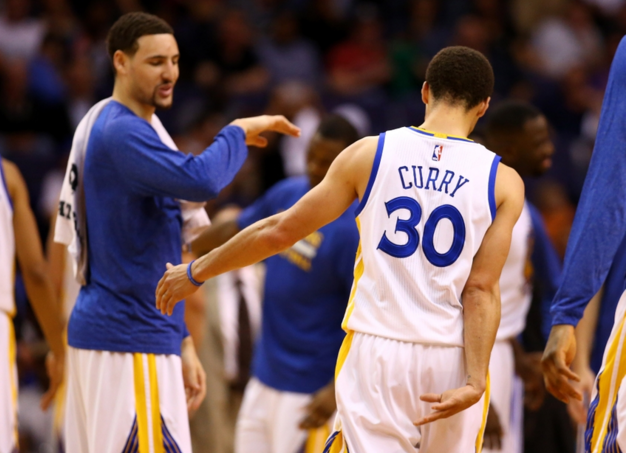 Expect the Splash Brothers to avenge that defeat and their loss yesterday with a W tomorrow. In GSW’s remaining six outings, we know which two are most pivotal: against the Spurs. And you know what the Warriors are hoping for? That coach Gregg Popovich will rest the starters. One player thinks this will happen. If this happens (and given that they play four of the six at home), chances are that the Warriors will break the record. For sure, NBA fans worldwide will be glued to the internet or the TV to follow GSW’s finale. What’s next? The playoffs, beginning April 16. For now, Steph Curry is compiling incredible numbers. One of those amazing stats is this: He’s averaging exactly 30.0 points per game. And you know his jersey number, right? What accuracy! Here’s another inconceivable (but-who-knows-it-may-happen) theory: Curry will win a 2nd MVP award — plus the Most Improved Player trophy.